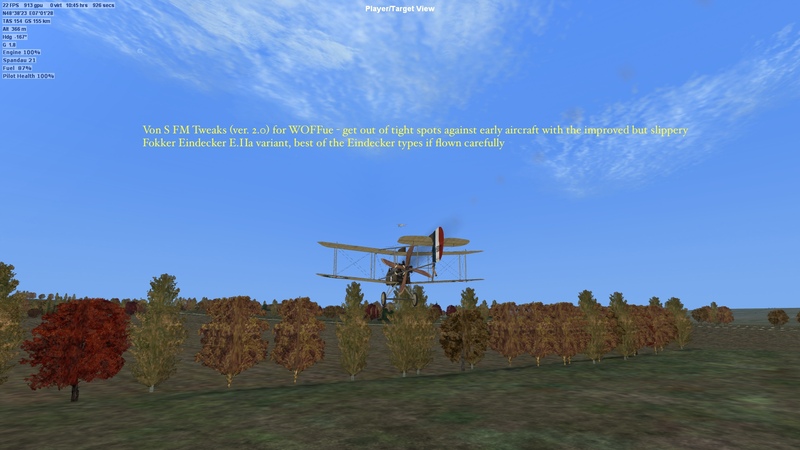 There you will find enclosed in the attached zip file four tweaked FMs for engined-up aircraft currently not present in WOFFue: a 150hp Fokker Dr.1, a late Albatros D.II 180hp, a Nieuport 25/27 165hp variant, and a tuned up late Sopwith Tripe. Please read the enclosed "Read Me" file for more info. on the FM tweaks. The FM tweaks are JSGME program enabled, for convenience. Simply move the four aircraft folders that you will find into the MODS folder of your WOFF user directory, toggle on/off with the JSGME enabler, and go fly. A big thank you to all the WOFFue modders and the good folks at OBD Software for making such an enjoyable sim. Those who fly these four and similar models in First Eagles 2 will become comfortable quickly with the FM tweaks, since they are similar across both sims. Representative pics. included below. Last edited by VonS; 10/16/18 06:03 AM. Reason: Changed title of post to reflect expanded FM mod. pack. Last edited by VonS; 08/23/18 02:51 AM. Reason: Service date suggestions now included in post regarding ver. 2 of FM tweaks. As an "ole" FM modder from RB3 days..looking forward to trying this out. Hello Captain, I still have a separate install of "Hell's Angels Gold Edition" in WineSkin, running your Royce II FM tweaks. Great stuff, your FM mods were a nice middle ground between the historical Greybeard ones and the sometimes overly sensitive ReDux Gold tweaks that showed up later. I still run RB3D occasionally. The FM tweaks for WOFFue are subtle modifications but they should help with these engined-up types. I won't be doing any extensive modding for WOFFue (too busy with my FE2 tweaks) - but I thought I'd share these tweaks with the WOFF community. But I don't know if it is still "up to date" ? Last edited by jeanba; 08/14/18 09:26 AM. Thank you for that link Jeanba, did not notice those files. It seems that they are for OFF Hat in the Ring, but I will compare them with the latest Spad xfm files. Perhaps some fine-tuning is possible. Having said that, I will be careful with "de-tuning" since I don't want the Spads to become slower than the impressive speeds on the N.28 for example (above 200kph) - this would then require de-tuning of the N.28, and may lead to a multitude of de-tuning tweaks across many xfms. I will respect OBD's decision to have uptuned some of the variants (I'm sure there is a variety of reasons why this is so in WOFFue) and will work on some of the placeholder aircraft as already done in my first set of FM tweaks. And I will indeed comb over the Spad files since I know those are some of your favorite types. 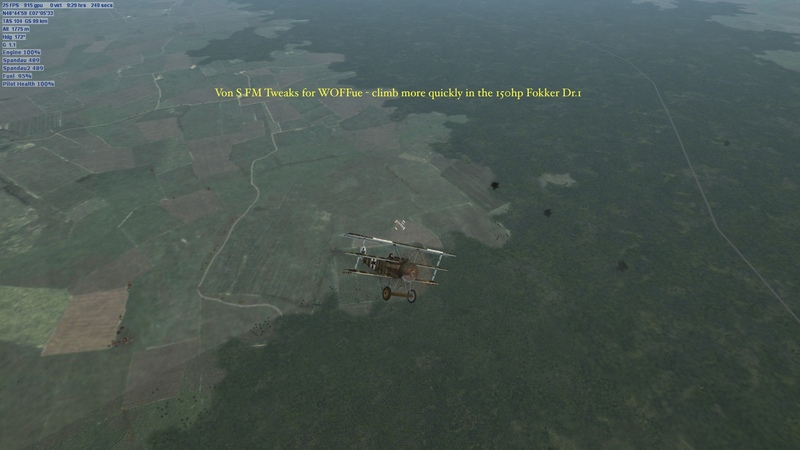 NOTE: For the broader WOFFue community, keep in mind gents' that top speeds in WWI would often vary even among the same type of aircraft, also depending on field mods, wear and tear, and maintenance quality or lack thereof - so slightly higher speeds across a few of the stock xfm files are still within reasonable historical assumptions, and they fit well with other types flown in WOFFue. For example, top speed on the Spad 13 is about 230kph - this is fine in relation to the top speed of about 205kph on the Nieu.28. Reduction of the N.28's speed to about 196-198kph would probably work better with reduction on the Spad 13 to about 218-222kph, another often reported series of values, and so on (which becomes an endless series of tweaks and re-tweaks). Also important is not to upset the AI maneuvers since they were likely trained on specific types, power outputs, etc. Thanks for the nice words Adger, much appreciated. Jeanba, have now checked over the modded Spad files for which you provided the link, for OFF Hat in the Ring. 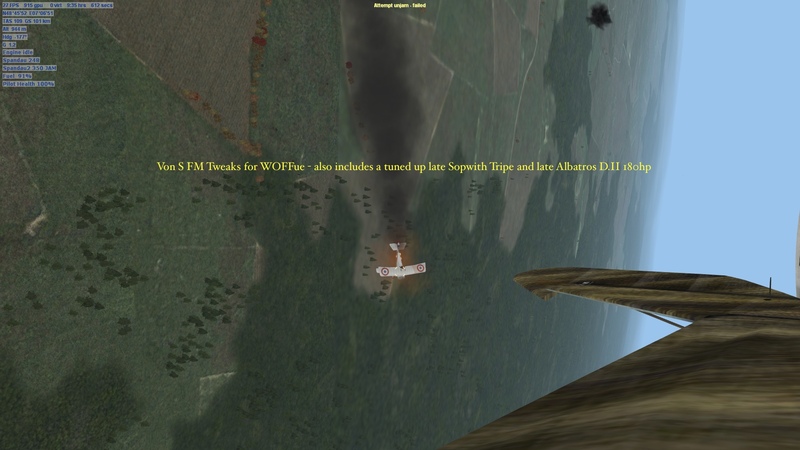 It appears that those FM mods were done using the "air" and "cfg" files that were previously moddable - both of those files, while still present in aircraft folders in WOFFue, are now locked. This leaves the xfm files as the ones to tap into for FM tweaks. I will run through the Spad xfms once I've done testing how the AI responds to my tweaked Alb. D.1, Fokk. E.IIa, Pup, and Se5. could be an intresting read on what is being made and figured out for Woff specific. Last edited by dutch; 08/18/18 09:02 AM. Thank you for that link Dutch - have looked at the Alb. D.V/Va modifications there. From what I've been able to find, the D.V/Va FMs were improved further for WOFF Ultimate Edition - while those FMs were for an earlier version of WOFF. Also will re-visit the Se5a (was trying to modify the xfm for the Se5, then the Se5a, to a geared Hisso 220 hp with 2300 rpm variant). In both cases crashes would result in WOFF (the modded xfm wouldn't be called up in WOFF). If this is the case I will leave the Se5a alone but will try one more time to tweak the FM. It's always been my impression that the SPAD VII was 150 and 180 only. The SPAD XIII came in 200 and 220 hp varieties. Yes indeed, standard engines on the Spad 7 were either the 150 and later the 180hp variant. There are also more obscure variants of the Spad 7, the Russian DUX plant variant, with lower ceiling and stiffer controls (those used pine instead of spruce, and featured coarser linen among other things). I think most of the DUX-built ones had 150hp powerplants. Also some British-built variants (by Mann Egerton & Co.) - featuring 140 or 150hp engines - again with lower ceiling and stiffer controls - but built more strongly than the French variants. A (very) small number of Spad 7 types were retrofitted with 200 or 220hp Hissos - probably no more than a handful - but I couldn't resist including it . It should theoretically have a top speed somewhere around 215-225 kph, and a better climb/ceiling than the 220/235hp Spad 13 (less weight among other things). With the Hissos it tends to get even more confusing since there were sub-variants with different compression and a variety of combos. being experimented on (low-compression 220hp, higher-compression 220, higher-compression 200, etc. etc.) - needless to say there's no need to mod every single power plant - I think three should be good (150/180/220 hp). Still working on those...hope they don't crash WOFFue (had no success loading modded xfm files for any of the Se5/Se5a variants so will leave those alone - perhaps some of their FM info. is hard-coded or locked into WOFFue). But I did manage to tune-up the Nieup. 23 into a rare 23bis variant...will include that one...only flown by the RFC/RAF...and supposedly sporting improved 110-120hp LeRhone engines with better air-intake valves (ram-air?? )...should give it about 125hp output. Last edited by VonS; 08/19/18 04:31 AM. Reason: Added info. The initial upload included an engined-up Fokk. 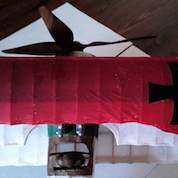 Dr.1, a tuned up late Sopwith Tripe, an engined-up Nieu. 25/27, and a late 180hp Alb. D.II. Last edited by VonS; 08/23/18 02:57 AM. Reason: Added pics. and fixed typos. Seems they're a bit slow approving the file...hoping the file will be up on CombatAce by tomorrow morning (today evening your time). Will double-check in the morning. 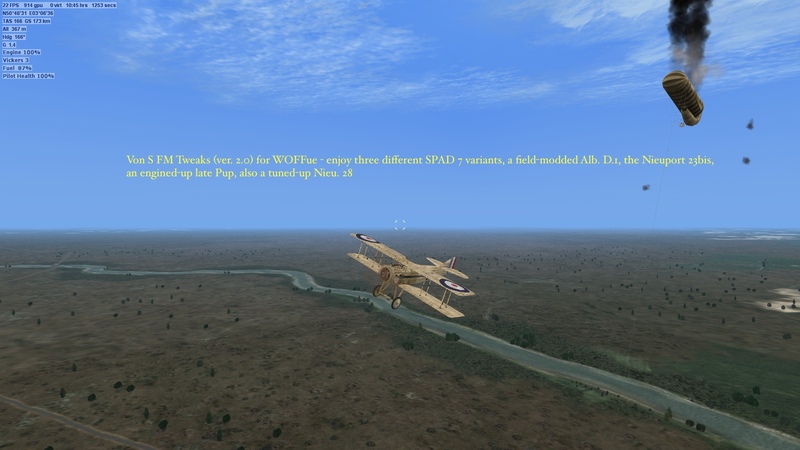 Any plans for the different engined Spad XIII’s? If there's enough interest in these FM tweaks for the engined-up/placeholder types (and I think there is) - I'm willing eventually to do a ver. 3.0 of the FM tweaks and cover several more aircraft. The Spad 13 I will comb-over: currently there's a 235hp Spad 13 represented, but no 220 and 200 hp variants. 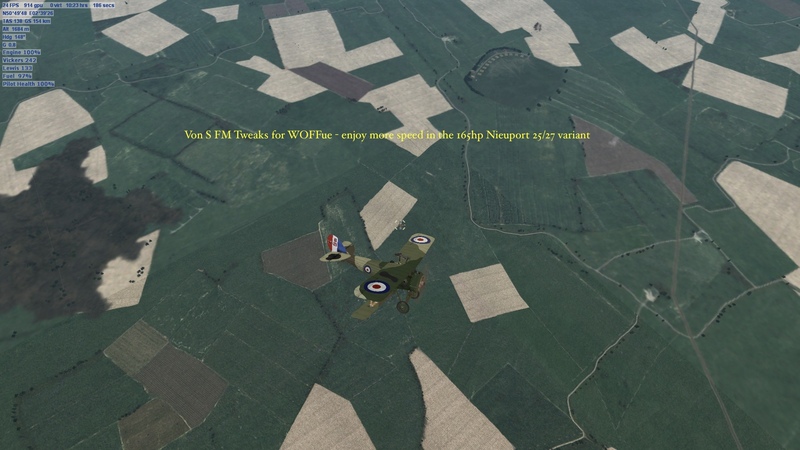 Perhaps some of our skin modders for WOFFue will be able to come up with a rounded wing-tip version of the Spad 13, to go well with a tweaked FM for the early 200hp version. Will also look at the early Nieups., the Alb. D.III/V/Va, and the Fokker D.7 and 8 for a ver. 3.0 update - might take me several months to get to that however. In the meantime I hope ver. 2.0 will eventually be posted on CombatAce - it sure is taking a while for the file to be approved.